and WINIFRED (DUTCH) AKUNA Paul Akuna, a veteran of the U.S. Air Force, died at 86 years old on August 6, 2012. Paul was born April 1, 1927 in Honolulu, Hawaii, and grew up in the Kalihi area. He spent 20 years in the U.S. Air Force working in navigation in various locations followed by civilian work at Mare Island, California as a marine electrician. Winifred (Dutch) Akuna was born in Honolulu as Winifred Low, the youngest of seven siblings, on February 7, 1929. She died from natural causes on October 28, 2018 at the age of 89. She spent most of her youth growing up at the Susannah Wesley Home for Girls. Once married, she became a homemaker and dedicated, loving mother to six children. 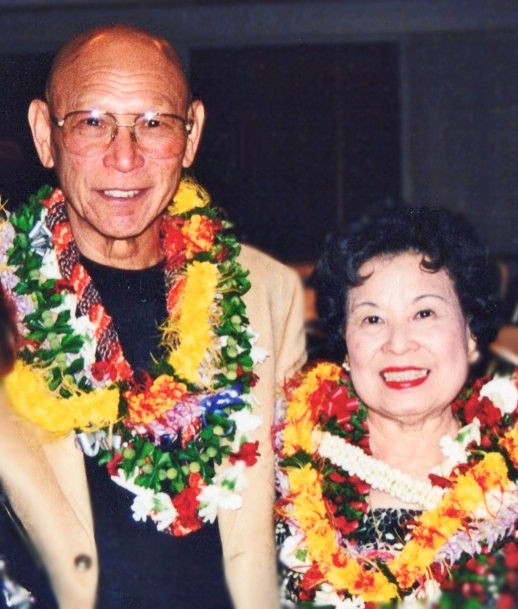 Both Paul and Winifred (Dutch) attended Farrington High School, graduating in 1944 and 1946 respectively. Soon after marrying in 1949, and as a result of Paul's military duties, they traveled extensively, finally settling in Northern California where they lived for 31 years. In 2006, they moved back to Hawaii, and from 2006 to 2012, lived at the Hawaii Kai Retirement Community. Paul and Winifred (Dutch) are survived by their children, Janis Akuna (Friedlander), Ginger Akuna, Paul Akuna, Bruce Akuna, Terrance Akuna, and Christopher Allen Akuna. Memorial services will be held with honors on Thursday, February 7, 2019. 10:30 am at Punchbowl National Cemetery. Lunch to follow downtown.